It’s no secret…I love all things crafty. Sometimes I take a bit of prodding to try something new as I am a fan of tradition, and change sometimes makes me a bit nervous. After reading Printing on Fabric: Techniques with Screens, Stencils, Inks, and Dyes by Jen Swearington, I am ready to try it out! 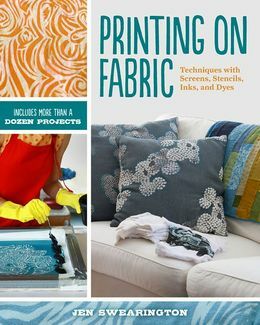 The book starts off providing a wonderful explanation of different tools, techniques, and products that can be used when printing on fabric. Jen tells readers how to set up their studio or workspace and also includes things to keep in mind when preparing a project. Examples are also given of unique items that can be used when printing such as a woven basket. Also, if one specific way of printing doesn’t work for you, no need to fear–instructions for many different kinds of printing are provided. The book also includes lots of projects that you can make yourself. 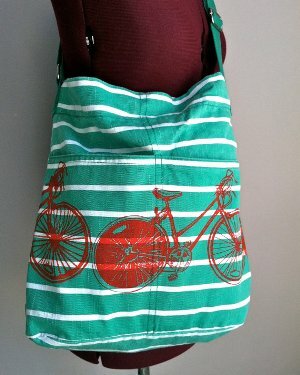 One of my favorites was this tote with a printed bicycle. When I was looking through the book this weekend, I also found this adorable pet bed. I’m sure that Puppycat would love a new bed. If only I could get her to not eat and chew on it. Any tips? Whether your looking for a new hobby or are looking for an interesting gift idea, this is the book for you. The easy to follow instructions will help you become a pro in no time! You can also check out Jen’s website for more projects that she has create. To have a chance to win a copy of this book, leave a comment below sharing a new craft you would like to try…or a tip to prevent dogs from chewing their dog beds. As mom and I will be going to a quilt retreat this weekend (super excited), we’ll be choosing a winner early next week. The good people over at Lark Crafts sent us this book for review. Here is a link to the book on their site. This entry was posted in Quilting, Try it on Tuesday on March 19, 2013 by Kelli. I feel for you with the chewing Puppycat..my dog chewed anything with stuffing/zippers etc. the only thing he didn’t chew was a crocheted afghan that we folded up for him to sleep on. Good luck finding that magic something. Some dogs just chew stuff! I don’t know about the chewing thing. I do save all the waste from trimmings & batting too smalll to zig zag together for stuffing a dog bed, I give it all to the local Humane society! Would love to try that tote with the printed bicycle — very cute! There are several crafts that I’d love to try – jewelry making (especially cabachon pendants) and soap making top the list. Our house is so small, that quilting is all I have space for atm. My problem is that I want to try all (or most, anyway)! What I am going to try next, however, is wool applique. I really want a project for hand work and I love the wool wall hangings, penny rugs, etc. that are so popular with a lot of quilters right now. I have a friend who solders jewelry and I’d like her to show me how some day! She does beautiful stuff! Does Puppycay chew the bed or chew something while on the bed? If it is the bed you can buy some bitter apple spray at the pet store. My chihuahua’s loved the edge of the carpet. I tried every remedy anyone would suggest and nothing worked. My vet recommended the bitter apple spray and something called No-No chew. I couldn’t find the No-No chew but the bitter apple spray worked great! One spray and they might try to take a bite but would back away and try to spit. It only too another day or two of watching them and they stopped. I also found them things they could chew and when I would spray their favorite carpet spot I would give them the rawhide or toy to try and teach them right and wrong chewing. That worked too. I hope that helps. Since we have no pets can’t give you any hints on chewing. I’d love to learn to rug hook, someday. 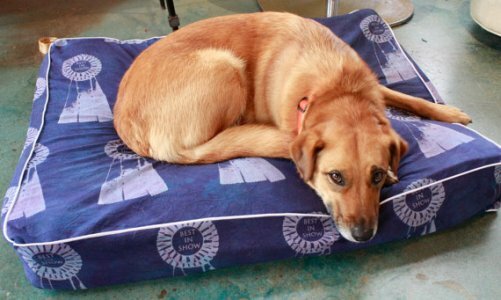 Hi—at least it gets better–I thought my little Lily would never quit chewing—even the ends off of the pumpkins I had for decorations…….I love that tote with the bicycles….. I have just started remaking lampshades. For the 1st one, I took a yardsale octagonal shade and ripped off all the fabric. Then I took leftover fabric strips and tied them between the metal “ribs”. It ended up being a really colorful shabby chic shade that adds some interest to my plain lamp. I want to try a paper punched shade next. I’ve done lots of kinds of crafts (and maybe I should go /back to/ a craft or two, rather than try a new one, but …) one area of crafting that I’ve never really done much of is printing/dyeing fabrics (or dyeing yarn, for that matter!) So this book sounds like a lot of fun! Thanks for a chance at a fun giveaway! I’ve always wanted to learn to crochet but haven’t gotten around to it yet. I would especially like to make an old fashioned granny square afghan. Maybe I need to be an old granny first?! haha! Have a great time on your retreat; let’s see lots of pictures when you’re back! I’d like to try screenprinting! I have no idea how to stop dogs chewing but I’d be interested to hear if anyone does!! I would love to learn how to weave fibre… as in placemats and table runners. I’ve been wanting to try snow dying muslin. Looks kind of like batik when all is said and done. I would like to learn to knit socks and to crochet. Printing my own fabrics is actually something I’d like to try. I was just looking at some Flickr photos from a swap group where they print a fat quarter of fabric and swap with others. I’d also learn to crochet. I would love to try snow dying. Running out of time this winter, but perhaps next year. I want to try making some crayon quilt blocks.